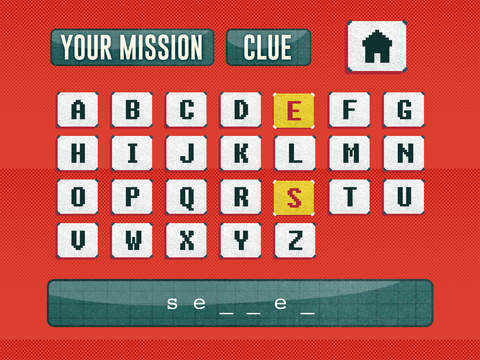 Secret Mission Articulation is a unique speech therapy game that challenges players to guess a hidden word by choosing from different letters on an alphabet board. The upgraded version of this app features a comprehensive collection of over 600 sound-specific articulation words designed for speech-language pathologists to use with individuals who exhibit difficulty producing the following speech sounds: S, Z, R, L, S/R/L Blends, SH, CH, and TH. 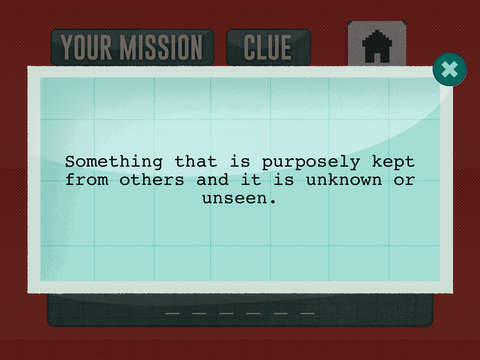 Secret Mission Articulation has been compared to the classic word guessing game called hangman. If you love playing hangman, then this speech therapy game is just for you! Tons of words: with just a tap of a finger, players can guess and practice over 600 sound-specific articulation words that are PERFECT for the speech therapy setting. Hear the words: each secret mission consists of a new password (sound-specific articulation word) that can be listened to for MAXIMUM retention. See the clues: all passwords come with HELPFUL hints that assist players with figuring out even the toughest of passwords. Lots of secret missions: with over 100 wacky and crazy secret missions, there is NEVER a dull moment with this app. Secret Mission Articulation is set up in a way that turns each player into a secret government agent who is courageously trying to foil the sinister plans of an evil robot. This super villain will stop at nothing wreak havoc. 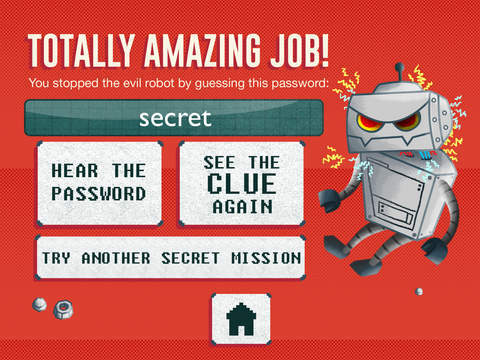 Thankfully, each player possesses the power to stop the evil robot by successfully guessing his secret password (and if the password is too tricky to figure out, simply press the ‘clue’ button for a bit of help). Once the password is uncovered and entered into the system, the evil robot instantly shuts down. Therefore, he is unable to complete the sinister plans that he was preparing for. Hooray! Traditional speech therapy that focuses on improving articulation abilities can usually get stale and boring, but through this exciting word guessing game, speech therapy can easily become an enjoyable competition that strengthens students’ thinking brains, talking mouths, and most importantly, their secret government agent skills (haha!). It is the hope of this speech-language pathologist that by encouraging students to participate in this word guessing game, they will be able to practice their pronunciation in a way that can lead to fabulous gains toward mastering their speech therapy goals and objectives. The structure of Secret Mission Articulation is a departure from traditional articulation drill work and is effective for students ages 6 and up. With this word guessing game, clients have a blast challenging their friends and classmates outside of the speech therapy room, further practicing their articulation skills and thereby facilitating the sometimes difficult stage of carrying over newly-acquired skills. By playing Secret Mission Articulation with the client, paraprofessionals in the classroom and/or parents at home can reinforce the client’s skills while sharing a fun activity. Practicing communication skills in environments outside the speech therapy setting increases opportunities for generalization of communication skills. So, are you ready to save the world from the evil robot? The planet is counting on you! I invite you to use Secret Mission Articulation to spice up your speech therapy sessions. Regardless of when, where, or how this game is used within the speech therapy session, one thing is certain, children (as well as clinicians) will have a delightful time giving this game a try . . . and in the process, your students will continue to practice the correct pronunciation of their sounds at the word level.